Bayeux's claim to fame is its "Tapestry," a medieval embroidery that tells the story of the Norman Conquest. The Bayeux Tapestry is truly amazing. It is tchnically not a tapestry but an embroidery, 70 meters (230 feet) long and 50 centimeters (20 inches) high, that was made in the 11th century. Think about it! It's an amazingly preserved cloth that is almost a thousand years old, and in beautiful condition, with vivid colors and characters that bring to life the story of the Norman Conquest. The Tapestry is displayed in a large oval hall in the Bayeux Tapestry Museum right in the center of the charming town of Bayeux, 30 kilometers northwest of Caen, in Normandy (map). Lighting in the hall is kept low to protect the artwork, but the light is adequate. An audio guide is included in the price of admission, and the narrator explains the 58 scenes that depict the Norman Conquest. It culminates in the Battle of Hastings in 1066, and those scenes realistically include severed limbs and other evidence of battle. All along the Tapestry are scenes of travel and adventure. You'll see colorful ships sailing across the sea and horses prancing and galloping across the plains as William the Conqueror leads his troops into battle against the English King Harold. Halley's Comet, which was visible in 1066, even appears in the Tapestry. It is assumed that the Tapestry was made by monks in England sometime after the Battle of Hastings. You walk slowly around the room, seeing each panel and the remarkable artistry. The visit takes a minimum of 20 minutes, but you may want to allow extra time to simply admire the beautiful, detailed embroidery. In addition to the Tapestry itself, the Museum also includes interesting exhibits about William the Conqueror and the Norman Conquest, as well as a 15-minute video on how the Tapestry was made. Special exhibitions are also offered from time to time. 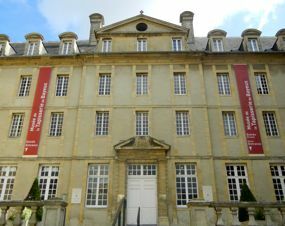 The Museum is a short walk from the beautiful Cathédrale Notre-Dame de Bayeux. 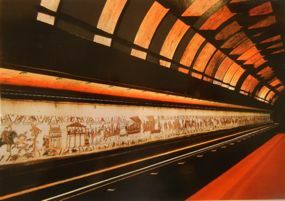 Above, a scene from the Bayeux Tapestry. Viewing room with the Tapestry.